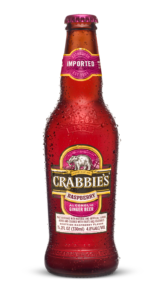 Crabbie’s Original Alcoholic Ginger Beer is part of Scotland’s famous Crabbie clan, founded in 1801 in the ancient Scottish port of Leith. With centuries of experience behind Crabbie’s and using only the finest products, all that can be said is that the uniquely refreshing sparkle of Crabbie’s Original Alcoholic Ginger Beer speaks for itself. Made from a secret recipe, Crabbie’s combines 4 top secret ingredients with steeped ginger, which is still shipped all the way from the Far East, just as the first Scots Merchant adventures did all those years ago. Taste Profile – The ginger in Crabbie’s Original Ginger Beer is steeped for up to six weeks to produce its deep, deliciously spicy flavor. Taste Profile – A refreshing, light bodied ginger beer blended with Scottish raspberries to create a refreshing raspberry-ginger flavor. Please use the Beer Finder to locate Crabbie’s in your area.